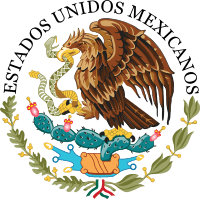 The Federal Government of Mexico is the national government of the United Mexican States, the central government established by its constitution to share sovereignty over the republic with the governments of the 32 individual Mexican states, and to represent such governments before international bodies such as the United Nations. Similar to the federal government of the United States of America, the Mexican federal government has three branches: executive, legislative, and judicial. Through the system of separation of powers each of these branches has some authority to act on its own, some authority to regulate the other two branches, and has some of its own authority regulated by the other branches. The seat of the federal government functions per the Political Constitution of the United Mexican States, as enacted in 1917, and as amended. The executive power is exercised by the executive branch, which is headed by the president and his Cabinet, which, together, are independent of the legislature. Legislative power is vested upon the Congress of the Union, a two-chamber legislature comprising the Senate and the Chamber of Deputies. Judicial power is exercised by the judiciary, consisting of the Supreme Court of Justice of the Nation, the Council of the Federal Judiciary, and the collegiate, unitary, and district tribunals. The federal government, known as the Supreme Power of the Federation, is constituted by the Powers of the Union: the legislative, the executive, and the judicial. Mexico City, as the capital of the federation is the Federal District, the seat of the powers of the Union. All branches of government are independent; no two separate branches must be vested upon a single person or institution, and the legislative power must not be vested upon a single individual. The legislative power is vested upon the Congress of the Union, a bicameral congress comprising the Senate (Spanish: Cámara de Senadores or Senado) and the Chamber of Deputies (Spanish: Cámara de Diputados). The powers of the Congress include the right to pass laws, impose taxes, declare war, approve the national budget, approve or reject treaties and conventions made with foreign countries, and ratify diplomatic appointments. The Senate addresses all matters concerning foreign policy, approves international agreements, and confirms presidential appointments. The Senate consists of 128 representatives of the constituent states of the federation. All senators are elected in free universal elections every six years through a parallel voting system as well: 64 senators are elected by first-past-the-post plurality, two per state and two for the Federal District elected jointly; 32 senators are assigned through the principle of "first minority", that is, they are awarded to the first runner-up party for each constituent state and the Federal District; and 32 are elected by proportional representation with closed-party lists, for which the country forms a single constituency. Senators cannot be reelected for the next immediate term. Mexico City did not belong to any state in particular, but to the federation, being the capital of the country and seat of the powers of the Union. As such, it was constituted as a Federal District, ultimately administered by the Powers of the Union. Nonetheless, since the late 1990s certain autonomy and powers have been gradually devolved. The executive power is vested upon a head of government now elected by first-past-the-post plurality. The legislative power is vested upon a unicameral Legislative Assembly. The judicial power is exercised by the Supreme Tribunal of Justice and the Judiciary Council. The Federal District was divided into delegaciones or boroughs. Though not fully equivalent to a municipality in that they do not have regulatory powers, they have gained limited autonomy in recent years, and the representatives to the head of government are now elected by the citizens as well. In 2016, the name was changed to Mexico City and the 12 delegations were transformed into municipalities each one with its own mayor. ↑ The form of government of the Federal District is outlined in the 112th article of the Political Constitution of the United Mexican States.